There is hardly on the face of the earth a less enviable situation than that of an Army Surgeon after a battle – worn out and fatigued in body and mind, surrounded by suffering, pain, and misery, much of which he knows it is not in his power to heal…. I never underwent such fatigue as I did the first week at Butler's Barracks. The weather was intensely hot, the flies in myriads, and lighting on the wounds, deposited their eggs, so that maggots were bred in afew hours. Tiger Dunlop, British surgeon to the 89th (The Princess Victoria's) Regiment of Foot, War of 1812. Contrary to popular belief, the typical soldier in the War of 1812 did not die from the effect of bullets or cannonballs, but rather from the effect of germs. Infectious disease was the number one killer: dysentery, typhoid or “lake” fever, pneumonia, malaria, measles and smallpox. Food poisoning was also common affliction, and the “flux,” an inclusive term for all types of diarrhea, rendered a soldier’s life miserable, and, in many cases, short. Of the estimated twenty thousand soldiers, militiamen and Native warriors who died in the war, nearly three-quarters succumbed to something other than a battle wound. A surgeon writing from Buffalo in November, 1812 reported that three or four soldiers of the U.S. Army there were dying each day, and that more than 100 of those wounded in an October attack on Queenston had died. The most common diseases afflicting men at Buffalo, he said, were measles and dysentery. At Lewiston, some units reported one-third to one-half of their men sick that autumn. The hospital tent of one regular infantry regiment held the bodies of five men who had been dead more than twenty-four hours but had not been buried, because there was a shortage of coffins. What prospects of recovery had the wounded, dying for a gill of gin or a spoonful of vinegar? Neither were to be had!... The camp exhibited a very melancholy spectacle. It was by no means astonishing that the troops should be generally gloomy and low spirited, when we come to consider that they were principally men of family who were on a tour of duty only for a few days; that many were already dead, others dying constantly. The big advances in military medicine were decades away. William Morton would develop ether anesthesia for surgery, but not before 1846. Florence Nightingale would create the professional nurse and reform the British hospital, but not until 1857. Robert Koch would put forth his germ theory in 1890. Although the War of 1812 took place well before these advances, there were many skilled military surgeons, most of them aware of the salutary effects of cleanliness. At one Army hospital in Burlington, Vermont for example, the ward master had a long list of rules: chamber pots were to be cleaned at least three times a day, and lined with water or charcoal. Beds and bedclothes were to be aired daily, and exposed to sunlight when possible. Once a month the straw in each bed sack was to be changed. If a patient died, the straw was to be burned. Personal hygiene was emphasized: each patient was to be washed every day and his hair combed. On some wards, a female attendant would clean, cook and scrub – they received $6 a month plus one ration a day for their efforts. This was a model institution. Even so, infection spread: in one month, a pneumonia epidemic killed seventy-five residents in the Burlington hospital. A typical field hospital would have the tools and medicinals to treat a wide variety of problems such as minor procedures. The common procedure would be lancing boils and abscesses to amputation of limbs. We’d also be also be engaged in brain surgery using trepanning, which is drilling a hole in the skull to relieve pressure from head wounds. We’d be engaged in blood letting which was a common medical therapy. We’d produce our medicines from scratch. They’d be weighed out and compounded and rolled into pills or produce elixirs. Enemas would also be prepared and administered. Sometimes cautery was used as a therapeutic treatment. And also counter irritation was used. And that’s the process of irritating one aspect of the body to direct attention away from the ill area and to assist in healing. 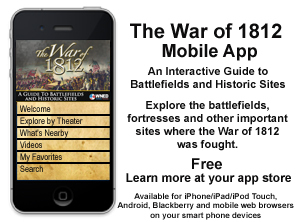 Skilled as some practitioners were, the war took place in a period when some medical attention could kill you. Army doctors used emetics to cause vomiting and cathartics to cause diarrhea, both as stomach cleansers. Patients were sometime bled intentionally. These cures often left the patients weak, dehydrated and unlikely to survive. Battle injuries, of course, just compounded the misery. A bullet in the head, chest or abdomen meant almost certain death. A bullet in the limbs meant a twenty percent chance of death if the wound was cleaned and in most cases the limb amputated. If a soldier was injured below the elbow and the injury was such that there was a lot of bone damage and torn up soft tissue it would be life saving to amputate the arm below the elbow. And the reason for that is infection -- it would set in if you didn’t amputate, and your death rate would be a hundred percent. As it turns out if you amputate below the elbow you have literally an eighty-five percent chance of survival. So you’ve really increased this man’s chance of living. The amputation was done without anesthesia, and the speed of the surgeon was essential. First you would put a tourniquet around the arm, your curved amputation knife, make a circular cut right down to the bone. And at that point you got your bone saw. A couple of quick swipes there. In less than two minutes, the limb dropped. At the time of the battle there would be one surgeon and one assistant for perhaps as many as a thousand soldiers. The soldiers often knew for days in advance that they were facing an amputation. A soldier might hoard his daily ration of alcohol, and consume it shortly before the surgery, in attempt to deal with the pain. Stoicism seemed to be the watchword of the day. There are accounts of soldiers singing, joking, and even smoking during an amputation. People at this time were familiar with pain, and soldiers were expected to rise to the occasion. Recovery took place in the hospital, where, in some units, a soldier received half-rations and half-pay as an incentive to get well quickly. 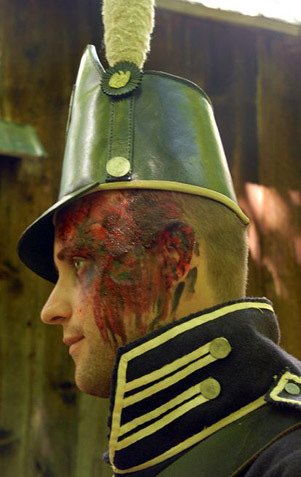 Re-enactor with makeup showing a head wound from musket fire Re-enactors portraying dead and wounded soldiers after the Battle of New Orleans. 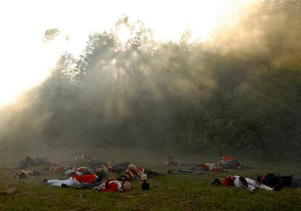 Re-enactors portraying dead and wounded soldiers after the Battle of New Orleans. 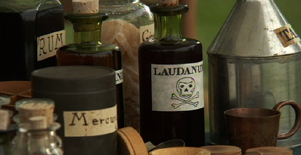 A sample of the drugs in the surgeon’s kit during the War of 1812.